We are so grateful for our volunteer reviewers. A handful of them read each chapter at least once, and a happy few reviewed all of our chapters through three revisions. We experimented with ways to get feedback. We tried Google docs, but that didn’t work as we had hoped. Eventually we shared PDFs of the chapters via Dropbox, and let the reviewers decide how they were the most comfortable giving feedback. Some added comments directly to the PDF, some sent us their feedback via emails. We read all the comments as we received them. We didn’t make changes to chapters immediately, but we responded with questions if we had them. We wrote and researched, collected stories, researched some more, and continued to write. We completed the initial draft of all the chapters right before Christmas 2013, so took a small break to enjoy some vacation time. Janet went down to Denver at the start of 2014 to join Lisa for an intense review of everything written so far. Based on a recommendation by Ellen Gottesdiener and Mary Gorman, we printed every page we had written. We also printed all of our contributors’ stories, and all the review comments for each chapter. 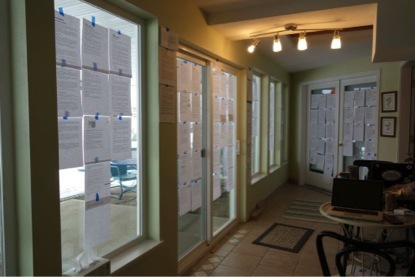 We taped all the chapters to the walls – here’s a picture of some of them. It was really quite exciting to see them in print. We arranged the stories on the ping pong table. You can see there were a number of them we had yet to decide where they went. We organized, and then we got stuck. What do we do now? Our initial plan had been for Lisa’s husband, Bob to feed us, and do the house and farm chores so that we could concentrate. Unfortunately, Bob was recovering from emergency eye surgery and was incapacitated. Lisa was distracted by her extra workload. So, we stepped back, talked about the kind of time Lisa could spare in between feeding donkeys, cats, dogs, etc. We created a personal task board with sticky notes so that we could plan a bit better. We made our iterations 45 minutes long and depending on what the chore was, the breaks varied between 5 and 20 minutes. While Lisa did her chores, Janet prepped the next batch of work, getting the comments ready and organizing the stories. OK, sometimes Janet was out shoveling snow or cooking meals! We went through all the reviewer feedback, deciding what made sense to us, and what we wanted to change as a result. We did a bit of reorganization, decided where we wanted to put the stories by writing all over our lovely printed pages. 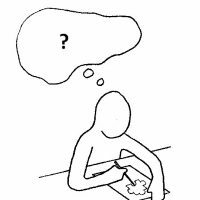 What that allowed us to do, was be creative and open, and mostly –not get stuck in what we had already done. The visual nature of this exercise enabled us to talk about it openly, and also see the impacts of our suggested changes. And because we used mind-mapping for our outline, it was easy to make these changes in the general structure. We then made a tentative plan for how we were going to tackle the revisions. First, we’d move all the pieces around so they were in the right place, and add the remaining stories into the chapters where we thought they made the most sense. 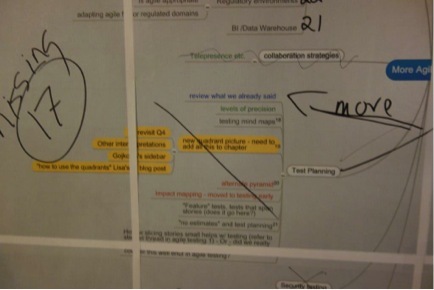 We then claimed specific chapters to start our initial edits, and started the rework. 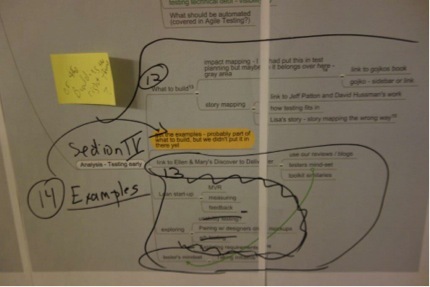 As we started this part of the process, we came to a startling realization – we wanted better illustrations for this book than we had in Agile Testing. Janet approached an artist she knew with some ideas. It was a great match and Jennifer Sinclair (our illustrator) did us proud. In some instances, we went back and forth several times to get the concept correct. In the end, we felt it was definitely worth the effort. As we worked in our usual distributed fashion again, we kept making use of the Pomodoro-style time boxes. On weekends when we both worked, we followed the same 25 or 45 minute time slots followed by breaks. Even though we were working on different chapters or tasks, pairing in this time-boxed way helped us maintain discipline and simply made the work more fun. 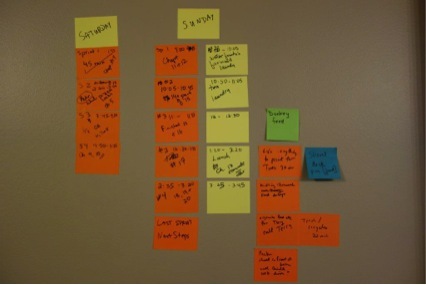 We each continued to use our personal kanban boards, which included both book-related tasks and house/barn chores. These techniques helped us work steadily and speedily, yet at a sustainable pace. A struggle during this round of editing was getting the contributors’ sidebars right. We felt some of the stories were too long for the book and we needed to edit them down without losing the main points. Some needed more editing than others. This proved to be harder than we anticipated. We have learned to edit each other’s writing with a hard stance, but working with other’s writing was much more difficult. Still, it was worth the effort. One of our volunteer reviewers suggested that we send out each part of the book (there are eight in all) for review to give context for each chapter. It was a successful experiment. We also sent the full chapter in which their sidebar appeared, to each story contributor, so that they could see their story in context and confirm that our edits didn’t change their intended message. The plan was to send a first draft to our publisher, incorporating the second round of reviewer feedback by March 1st, so that developmental and technical reviews could begin. We were one day late. For the next month, as we waited for that feedback, we concentrated on getting finished images, working on the bibliography, glossary and contributors’ bios. 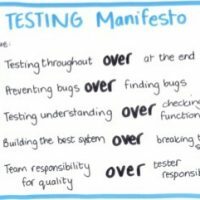 We also decided we’d better choose a title for the book, which we still referred to as More Agile Testing. We asked for ideas from all our reviewers including the technical reviewers, and received more than we had expected. 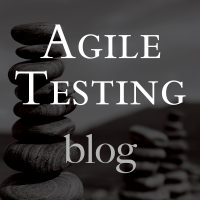 Some people suggested Agile Testing 2.0, or Continuous or Continual Testing. The subtitle was even harder. We ran several through http:www.aminstitute.com/headline/, which is supposed to tell you if it’s a good title or not. In the end, we went with what felt the ‘most right” in what we thought our book was representing. Thank you to Geoff Meyer for coming up with the idea for Learning Journeys. Now it was April 1st, and the July 1st deadline was just around the corner for the final manuscript. The rounds of informal reviews paid off. In our first book, the technical reviews suggested major changes. This time, the recommendations that came back were corrections, clarifications, and mostly minor fixes. It was a huge relief. Janet’s niece was taking courses in copy editing at the time, so volunteered to go through the book – this was a win-win for us. She got some practical experience, and we had an opportunity to clean things up before our manuscript went to the production copy editor. Life intervened again during the book production process. Lisa was side-tracked by an illness and then death in her family. Then, several weeks later, Bob had emergency brain surgery; he recovered just fine but Lisa had lots more on her plate again for a few weeks. This is one place that pair-writing really pays off – Janet took up the slack and kept the book on schedule. Again we were fortunate to work with a terrific production team at Addison-Wesley. We got into a rhythm during the development edit, sending chapters, getting them back to correct and accept changes. This continued during copy editing, indexing and proof reading. Print copies of our book were available for sale on October 10, about a month ahead of the original schedule. We had escalated our schedule to be able to give away copies to finalists of the Software Testing World Cup at the Agile Testing Days conference in Potsdam, Germany.